Recorded at The Garrison (Camp Wavelength – Night 1), August 18, 2017. Indeed, heading into The Garrison, there was a vibe more like February's anniversary festival than August's Island excursion, a feeling that lingered through a night of groove-friendly programming. The sudden crowding in front of the stage as this set began reinforced the in-a-bar-to-see-a-headliner aspect of things, but the sheer joy of Jessy Lanza's electropop pastiche made it feel more like a cozy dance party. 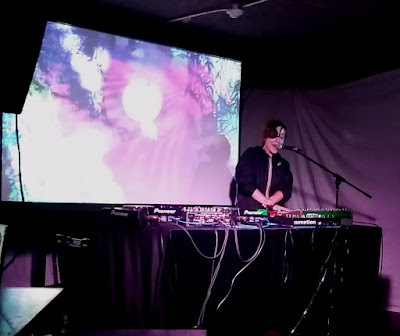 Often twiddling knobs behind an impressive table of gear, Lanza would also make some forays to the front of the stage to dance, while behind her projection art incorporated images veering from hardscrabble Hamilton scenes to abstract night-blurs.